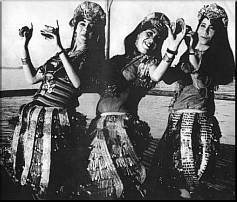 First and foremost, the Ghawazee are the dancers of Egypt. That said, a little clarification is in order. Beginning in the 18th century many Europeans journied into the lands of Egypt for trade, leisure, exploration, and colonization. Once there, they met many startling and wonderful sights. Among these sights, were the dancers--women draped in light cloth and ample pantaloons, scarves tied round their hair and hips. Their dance was chaotic and orderly, frantic and measured all at once. While the term Ghawazee was and is often applied to all Egyptian dancers, this is not accurate. Ghawazee are a specific group/tribe/ethnic group. Today the term Ghawazee refers more to country dances and dancers--dancers who have not been influenced by Latin, Indian, or other Modern dance forms as is often seem in the caberet clubs of Cairo. Another term often seen applied to Egpytian dancers is Awalim--this refers to professional dancers; educated, independant women. A single woman is an Almeh, the entire class of dancers is the Awalim. Opposed to the Awalim, the Ghawazee were relatively uneducated and performed their dance on the street and in the presence of men. It was this willingness to display themselves and their art that led to the eventual exile of the Ghawazee. The dancers, during the French occupation, found that the French soldiers were quick to empty their pockets for a good dancer. The Ghawazee followed the camps, much to the embarassment of the ruler who exiled the lot of them to Esna (Isna). During the Victorian era, artists were taken with notions of the exotic dancers of Egypt. This was the height of Orientalism. Of course, the artists, being men, had no access to the harem or the private gatherings of women where the majority of dancing took place. So, what they lacked in actual knowledge, they let their imagination supply. Thus were produced the paintings of scantily clad women lounging among pillows, draped in silk, sinuously dancing before contented sultans. Phooey! Accompanied by Mizmar music, the dance of the Ghawazee involves mostly hip and leg movements involving the torso only rarely. Typically emphasizing the down beat, there is a lot of stomping and clapping in this style of dance. In the 1970's the Bellydance scene in America was limited to the classes of Jalima Salimpour and Masha Archer, both in Califonia. Their brand of fusion dance, of mixing styles and cultures, of fantastic and revealing costuming was the norm. Then, something happened. At a typical Bellydance convention/contest a young woman took the stage wearing a skirt with diagonal stripes of fringe under a belt of vertical strips of sequined fabric. She began by describing the history of the dance she was about to perform, and the culture from which it came. Her dance was unlike the balletic dance with which all present were familiar. Aisha Ali had changed the face of Bellydance in less than 30 minutes. Ali introduced the idea that the dance had truly come from somewhere worth learning about, that the dance had a cultural history all its own. She had travelled to Egypt, met the Banait Mazain, learned their dance and their oral history, and brought it back to share with American dancers. To the right you see a photo of the Banait Mazain--modern Ghawzee dancers. They claim to be the last of an ancient Ghawazee line.